Pioneers in the industry, we offer plastic bangle engraving and drilling machine, plastic bangle drilling machine and acrylic bangle engraving machine from India. Our company is leading organization of this industry engaged in offering the range of Plastic Bangle Engraving and Drilling Machine to our important clients. They have high in quality and superior in performance. We carry our detailed processing to make our products range and make them perfect in every aspect. Our offered range of Plastic Bangle Engraving and Drilling Machine gives the hassle free long service life to the user and available at feasible prices. We believe in customer satisfaction so we processed our products range and offer affordable prices to our customers. Plastic Bangle Engraving and Drilling Machine offers drilling and engraving on acrylic and plastics bangles. Plastic Bangle Engraving and Drilling Machine drills/ engraves bangle with a design. The software is developed as per Indian market requirement. Run on very motion control card. Taiwan ball screw ensures the high precision of the machine. The Plastic Bangle Engraving and Drilling Machine adopts Hiwin linear rails with high quality which promises the reliable of with Rotary Y axis. Among its many features are ease-of-use, high performance, flexibility, and low cost that give you the best LIPIMark software on the market today. LIPIMark software is developed by our highly skilled professional's developers. Plastic Bangle Drilling Machine is used for acrylic, plastics Bangle engraving and drilling. Plastic Bangle Drilling Machine can drill and engraving on acrylic and plastics bangles. Plastic Bangle Drilling Machine drills/ engraves bangle with different design. Plastic Bangle Drilling Machine run on very high speed FPGA based motion control card. The Plastic Bangle Drilling Machine adopts Taiwian Hiwin linear rails with high quality which promises the reliable of X,Z with high Speed Rotary Y axis. Fostered with a team of highly experienced professionals, we are involved in offering our clients an extensive assortment of Acrylic Bangle Engraving Machine. Owing to its some brilliant features like easy operation and high efficiency, the offered Acrylic Bangle Engraving Machine is highly acclaimed by our clients. Acrylic Bangle Engraving Machine can drill and on acrylic and plastics bangles. Acrylic Bangle Engraving Machine drills/ engraves bangle with the design. 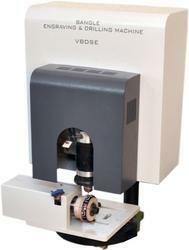 Acrylic Bangle Engraving Machine run on very motion control card. The Acrylic Bangle Engraving Machine adopts Hiwin linear rails with high quality which promises the reliable of with Rotary Y axis. Among its many features are ease-of-use, high performance, flexibility, and low cost that give you the best LIPIMark software on the market today. LIPIMark software is developed by our highly skilled professional’s developers.